Charleston, SC – I’m typing this post as a nice breeze blows across the docks at Charleston City Marina. We’d hoped to be arriving in Beaufort, NC this evening, but nasty weather thwarted that plan…and there was no sweeter smell than the loamy scent of land as we inched into Charleston’s harbor in the dark last night. We left Ft. Lauderdale mid-morning on Tuesday, Aug. 21, after spending a couple of hours on last-minute configuration of a Spot GPS tracking device. We’d bought the gadget the night before, after going over our preparations with Captain Sarah Cavanagh, who had just flown in from Boston to make the trip north with us. We’d include the GPS track in our float plan, as a way of helping the U.S. Coast Guard find us if we needed rescuing while out at sea. We sailed into the wind the first day, and Allan and I experienced our first bouts of seasickness. Allan recovered enough to help with night watch, but I was down for about 18 hours. Note to self: pre-medicate before any future passage! Wednesday brought glassy, royal blue seas. 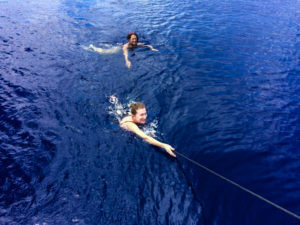 I was back on my feet – and into the deep ocean water….something I was afraid to do, but what better day than a birthday to release an old fear. Allan laid out a beautiful plate of celebratory fruit, and he and Sarah sang a lovely Happy Birthday. It was a great day: easy motion, with plenty of time for leisurely conversation while we made steady progress motorsailing. I did my first night watches, easing Sarah and Allan’s load a bit. Sarah picked up a ton of slack our first day out, when both of us were zapped with seasickness. Our third day out was Allan’s birthday. While memorable, it was not nearly as sweet as mine. 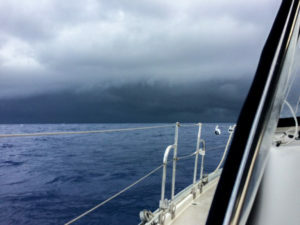 Around 9 am we encountered gnarly weather blowing in earlier than expected from the north as we neared the aptly named Cape Fear. Sarah displayed steely grace under pressure as the line to our mainsail tangled on the electric winch (a possibility she had “trained” us to address the day before). Once the dark skies enveloped us there was no time or way to take photos as all of our hands were busy adjusting lines, or simply holding on amidst the rain, wind and rocking seas. We decided to turn around and head to safe harbor in Charleston, about nine hours away. We had no way of getting a fresh weather report, or of communicating with the outside world other than pressing the SOS button on our Spot tracker. That would have triggered emails to two trusted contacts asking them to call the U.S. Coast Guard with our position, but fortunately, things didn’t get bad enough to warrant that. We regained minimal VHF communication about 50 miles from Charleston: we could talk to the Coast Guard but couldn’t understand what they were saying in response. After another hour or so, we were finally able to hear VHF weather reports, calling for severe thunderstorms in Charleston with damaging wind gusts, encouraging small ships to seek safe harbor. Time passed slowly. I was down for a few hours with another bout of seasickness, but recovered enough to stand watch and give Sarah and Allan a chance to rest. Lightning was our companion for so much of the way, that I am now familiar with shapes I didn’t know existed: loopy Ws and circles in addition to fat, straight strikes down, or spidery strikes across the clouds. We’d hoped to get into Charleston with the last light of the day, but it was dark by the time we arrived. With lightning all around us, waiting to come in the next day was out of the question. 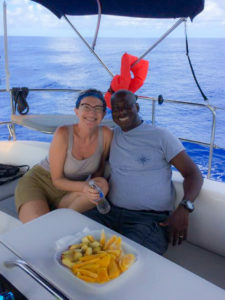 We motorsailed cautiously into the harbor with Sarah driving and monitoring the chart plotter, and Allan and I up on the bow with an iPad running Navionix and our four eyes watching for obstacles in the dark. On our “easy” sail day we’d been talking about magic and how it can present itself in our lives…and we all agreed that a hefty dose of magic kept us safe yesterday. Next time we do a passage, we’ll make sure to have an Iridium Go or similar device to avoid a repeat of our weather “blackout” and we’ll also make sure to have a liferaft aboard. We’d delayed both purchases thinking we really wouldn’t “need” them until we start cruising full-time in a few years…and with hindsight, it would have been best to have had both onboard, especially the Iridium Go, which likely would have prevented our running into the storm, which we thought wasn’t coming for another 36 hours. The rest of our trip up to the Chesapeake will be on the Intracoastal Waterway, a welcome change of pace, albeit much slower and time consuming than we would have preferred. Love! Glad you are all safe and the Captain sounds amazing. I’m so happy I found your blog. Also happy that you got through the storm and into port safe and sound.